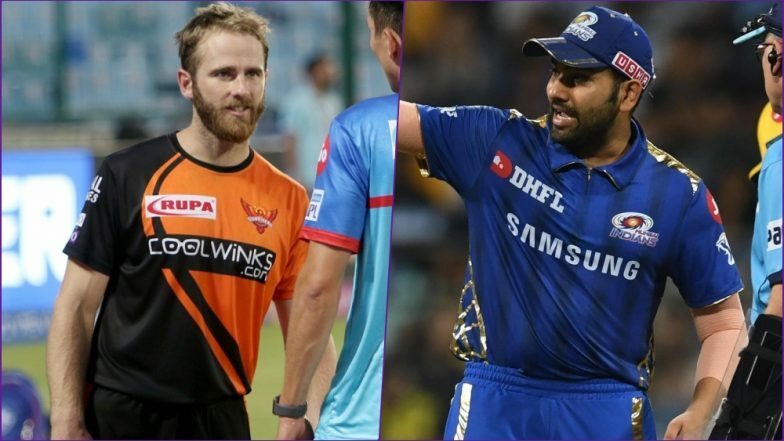 SRH vs MI Head-to-Head Record: Ahead of IPL 2019 Clash, Here Are Match Results of Last 5 Sunrisers Hyderabad vs Mumbai Indians Encounters! Mumbai Indians (MI) will have their tails up after defeating Chennai Super Kings (CSK) in a game they looked destined to lose at one stage. They take on Sunrisers Hyderabad (SRH) in next game of VIVO Indian Premier League (IPL) 2019 that will once again test their mettle and that too on enemy territory. Hyderabad have begun well with three win on the bounce after an opening day defeat against Kolkata Knight Riders (KKR). This IPL 2019, SRH have hardly put a foot wrong be it with the bat, bowl or on the field. Speaking of SRH vs MI head-to-head record, the two giants have played each other 12 times with Hyderabad edging the head to head contest with seven win to Mumbai’s five victories. A quick look at their last five games. SRH vs MI, IPL 2019 Match 19, Key Players: David Warner to Hardik Pandya to Rashid Khan, These Cricketers Are to Watch Out for at Rajiv Gandhi International Stadium. A disappointing result for Mumbai who could not chase a low score of 119 in front of a capacity crowd at the Wankhede Stadium. Siddarth Kaul was on fire for Hyderabad picking up three Mumbai wickets who could just not come out of the first gear. Apart from Surya Kumar Yadav not one Mumbai batsman looked like adapting to tough conditions as the hosts folded for 87. Hyderabad had to depend on the composure shown by their no 11 Billy Stanlake who scored five crucial runs in two balls to win a thrilling game for his team. Chasing a paltry 148 runs for the win, Hyderabad had a lot a way a bit in the middle period where none of their batsmen scored big. Deepak Hooda held one end with a patient 32, but it was the tail-ender Stanlake who was the hero of the game hitting the winning runs. Siddarth Kaul loves bowling against Mumbai, and the pacer picked up three wickets again to restrict Mumbai Indians to 138/7. Rohit Sharma fought a lone battle for Mumbai with a 45 ball 67, but the rest just perished without much contribution. Shikhar Dhawan’ s 62 helped SRH secure a seven-wicket win in 18.2 overs. Sunrisers Hyderabad went hard at Mumbai after posting 158/8 to try and make a contest, but the Men in Blue survived the stiff resistance well. Nitish Rana, Krunal Pandya and Parthiv Patel all contributed with the bat for Mumbai who claimed a four-wicket win. Panic and chaos gripped Mumbai’s batting as they slumped to an 85 run loss at the hands of Sunrisers Hyderabad after being bowled out for 92 in less than 17 overs. Ashish Nehra and Mustafizur Rehman, the two frontline pacers for Hyderabad took six wickets between them to lead the Hyderabad response. These two teams have engaged in close encounters in the past, but in most instances, it has been Hyderabad who have gone on to win the match which is not a good read if you are a Mumbai fan.